Mr. Garland "Junior" Duke, age 80, of Fowler, Indiana, formerly of Switzerland County, Indiana, entered this life on November 14, 1937, in Breckinridge County, Kentucky. He was the loving son of the late, Garland D. and Sarah (Davis) Duke. Junior was united in marriage on February 22, 1957 in Hawesville, Kentucky, to Wanda Nell Noble and to this union arrived three children to bless their home. Junior and Wanda shared over 61 years of marriage together until his death. He was employed as a machinist for Stedman Foundry in Aurora, Indiana, before becoming disabled. Most of all, Junior loved farming and working alongside his sons cutting wood and working with the team of pulling horses, Tom and Buck. Junior was a member of the Bennington United Methodist Church. He resided in Fowler, Indiana since July 4, 2018 and in Batesville, Indiana and Switzerland County, Indiana. He loved his grandchildren and great-grandchildren, spending countless hours teaching them to hunt, fish and most of all how to have fun. Junior passed away at 6:44 a.m., Monday, October 1, 2018, at the Green-Hill Manor in Fowler, Indiana. Junior will be deeply missed by his wife: Wanda Nell (Noble) Duke of Fowler, IN; his son, Steve Duke and his wife: Jamie of Fowler, IN; his daughter, Tracy Duke of Versailles, IN; his grandchildren, Jason Duke, Lindsey Nelson, Courtney Baker, Natasha Cox, Elisha Heim, Brandon Duke, Ethan Eversman, Kami Eversman and Erin Bradley; his great-grandchildren, McKenzie, Paycin, James, Jonah, Lyndy, Jack, Jayden, Brently, Markus, Adylyn, Briar, Alli, Brody, Alex, Lydia, Rowan, Thatcher, Leighton, Abraham, Michael, McKenna, Mavery and Manning; his sister, Cora Kelly of North Vernon, IN and his nieces and nephews. He was preceded in death by his parents, Garland D. and Sarah (Davis) Duke; his son, Garland "Dale" Duke, died April 17, 2015; his brothers, John Duke and Frank Duke; his infant brother; his sisters, Pauline Jarboe, Ruby Taul, Sally Wethington and Jean Sago. Memorial Services will be conducted Friday, October 5, 2018, at 11:00 a.m., by Rev. C. Martin Justice, at the Haskell & Morrison Funeral Home, 208 Ferry Street Vevay, Indiana 47043. Interment will follow in the Slawson Cemetery, Bennington, Indiana. Friends may call 10:00 a.m. - 11:00 a.m., Friday, October 5, 2018, at the Haskell & Morrison Funeral Home, 208 Ferry Street Vevay, Indiana 47043. 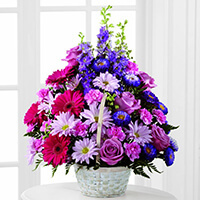 To send flowers to the family of Garland "Junior" Duke, please visit our Heartfelt Sympathies Store. We encourage you to share any memorable photos or stories about Garland. All tributes placed on and purchased through this memorial website will remain on in perpetuity for future generations. My deepest sympathy to the Duke family. I enjoyed working with Junior at Randalls. Our deepest sympathies and condolences.